Tremors are non-intentional rhythmic movements of a body part, which are the result of alternating or irregular synchronous contractions of muscles that have an opposite effect on a joint. For example, muscles that, when contracted, result in flexion of the wrist are stimulated synchronously with muscles that result in extension of the wrist. The result is a rhythmic flexion and extension of the wrist. This phenomenon can happen in any part of the body. It is this rhythmic quality that defines and distinguishes tremors from any other abnormal movements. The normal or physiological tremor is a fine, almost imperceptible, tremor that is difficult to see by the naked eye and does not interfere with activities. It can be seen in the fingers when the arms are outstretched. The frequency of the contractions is in the area of 8 to 13 cycles per minute. The cause of this tremor is not known, but it is not considered to be associated with any disease process. The abnormal or pathological tremor it is more obvious and more visible to the naked eye. As such, it does interfere with everyday activities. The frequency of the contractions is in the area of 4 to 7 cycles per minute. In many instances this tremor is associated with defined medical conditions. Most often the abnormal tremor is observed in the distal parts of the limbs (hands, fingers); however, every part of the body (such as the head, the tongue, the vocal cords, or the trunk) can be affected by the tremor. The clinical distribution of the tremor might be different depending upon the medical condition associated with it and some individual factors. However, in a particular individual the quality and distribution of the tremor is very constant. A resting tremor (also call Parkinsonian tremor) is observed in a body part that is not active and is completely supported against gravity. It is a coarse, rhythmic tremor, often localized in the hands and forearms, but less frequently seen in other parts of the body and is observed when the limb is in a position of rest. Intentional movement might decrease the intensity of the tremor. However, the tremor disappears when the limbs are in extreme rest, as it is the case when the patient is sleeping. This phenomenon is common to most of the tremors. In the hands, the tremors result in a peculiar "pill rolling" movement of the fingers, more obvious between the thumb and the index finger. Other parts of the body might also be affected. For example, the eyelids tend to flutter, and the jaw and the lips can flicker. When the legs are impaired it might result in gait (walking) problems. This tremor is most often seen as a manifestation of the Parkinson's syndrome. Postural, or action tremor, is observed when muscles voluntarily contract. This tremor is exhibited with any attempt to keep the limbs or trunk in a particular position, for example to keep the arms outstretched. This type of tremor becomes worse when the limb is actively moved, for instance, when trying to drink from a cup. However, no tremor is observed when the limb is fully relaxed. This tremor is most often seen as a manifestation of essential tremor. Intention (ataxic) tremor can be a very disabling type of tremor. It has some of the characteristics of the action tremor in the sense that it is triggered by movement; however, its main feature is that it occurs at the end of an action, when a fine, precise adjustment is needed. For example, when a person is asked to touch the tip of the nose, the early part of the action does not elicit the tremor, but as soon as the finger is near the nose and has to zero in on the tip of the nose, an irregular, rhythmic tremor with a frequency of 2 to 4 oscillations per minute is seen. Unlike action and resting tremor, the oscillations are in different planes and may persist even after the task is achieved. This type of tremor is mostly seen in conditions associated with the cerebellum or its neurological connections. Rubral tremor is characterized by intense, violent movement. With this type of tremor, a patient's slight movement of the arms or attempts to maintain a static posture, like trying to keep the arms outstretched, results in an intense rhythmic "wing-beating" movement. It is also associated with some interruptions of the cerebellar connections. This type of tremor is seen most often, among other conditions, in persons with multiple sclerosis. In general, one particular tremor type is predominant and sometimes the only tremor present in a defined clinical condition, for example, resting tremor in Parkinson's disease or postural tremor in essential tremor. However, there are several individual variations, and it is not unusual for a patient with a defined clinical condition, for example Parkinson's disease, to have, besides the resting tremor typical of the disease, some degree of postural tremor. The causes of tremor are very diverse. However, even though the list of potential causes is very extensive, a few conditions are predominant. The most important will be discussed here. Familial and essential tremors are the most common conditions associated with action tremor. In the familial, or hereditary form, several members of the same family are affected. This is a genetically heterogeneous condition, and more than one gene might be involved. The non-familial form is referred to as essential tremor because it is not associated with any other neurological condition. The term "benign essential tremor" has been used in reference to this tremor; however, this is misleading since the tremor can be very severe and disabling. The essential and the familial hereditary forms are similar in clinical presentation. In some affected individuals the tremors start in infancy, however, more often they appear in the second and third decade of life and are most prevalent when a person is in his/her 60's. It is seen in both sexes with similar frequency. Most often, the first signs of tremors are seen in the arms, usually in both of them. The condition is chronic and, in many instances, progressive; as time goes by, other regions are involved including the head, neck, chin, and mouth. The tremor in the arms interferes with many activities such as eating and drinking. Other clinical manifestations might be a tremulous voice, a continuous head movement in a vertical "yes, yes" or horizontal "no, no" pattern. The legs are rarely affected. The tremor might be severe enough to result in functional disability. Tremors increase with anxiety and stimulant drugs and may decrease with the ingestion of alcohol. There is no diagnostic test that confirms the condition. The diagnosis is based on clinical findings. However some tests might be indicated to rule out other conditions. The better known of these conditions is Parkinson's disease, a degenerative progressive disorder of the brain that predominantly affects a deep structure of the brain called the substantia nigra, located in the basal ganglia. The cause of the disease is unknown, the strongest associated risk factor being age. In some individuals, genetic factors might be important. In addition, the patients present with loss of facial expression and slowed speech with repetition of words. The symptoms progress slowly, and as the disease progresses the tremors are more prominent. This is an action tremor similar to the essential tremor, best seen when the hands are outstretched and fingers spread apart. It is seen in association with intense anxiety and in situations of stress. It can also be associated with certain disease states such as hyperthyroidism and hypoglycemia; in withdrawal syndromes (alcohol or sedatives withdrawal for example); and associated with drugs [coffee, tea, lithium (Eskalith, Lithobid)]. Psychogenic tremors are very complex and do not fit very well with any of the prior categorizations. Individuals with Psychogenic Tremor might show characteristics of action as well as resting tremors, with clinical features that change in short periods of time and with a degree of disability that is not proportional to the tremor. The onset of the tremor might be very acute and not related to any other diagnosed medical condition. In some cases, the tremor might be induced by suggestion. Some patients have a prior history of somatization (expressing psychological distress in terms of physical symptoms). In some cases, there is some secondary gain associated or attention-seeking behavior associated with the tremors. This is a very challenging diagnosis. If an underlying emotional condition is diagnosed the patient should be referred to a psychologist or a psychiatrist. The use of many drugs and also toxins can result in tremors. Many of these drugs are indicated for treatment of medical conditions. In many instances, the tremor is an undesirable side effect that can be controlled simply by decreasing the medications. In other instances the medications have to be discontinued. In the case of tremors secondary to exposure to toxins, the individual should be removed from the source of the toxins. Additionally, some specific treatments are available. The most common type of drug-induced tremor is the enhanced physiological tremor and is related to the use of drugs such as stimulants, steroids, antidepressants, and caffeine. The Parkinsonian tremor is also frequently seen as a drug-induced tremor in patients taking certain types of drugs. The treatment of these tremors is related to the primary condition. These are tremors that are seen only or almost exclusively in relation to a certain task. As long as the patient is not involved in that task, there are no symptoms, and the limbs can be used normally. The most common example is the writing tremor. A good rule of thumb is any isolated tremor, that is a tremor is the only sign, that lasts more than a few months or interferes with daily functions deserves a medical consultation. When the tremor is associated with any other clinical sign, a medical consultation is always indicated. Given the variety of causes that can result in tremors, the best person to consult first is the primary care physician. Later, the patient may or may not be referred to a specialist. Metabolic screening including blood levels of electrolytes, glucose, urea, and nitrogen. Neuroradiological studies: CT Scan, MRI, PET and SPECT. Some tests, such as surface electromyograms and mechanical recording devices, help to define the rhythmicity, amplitude, and frequency of the tremors as well as the relationship between tremors and movements. These are not highly used in medical practice. Other tests are useful to diagnose diseases that might be associated with the tremors. In many instances a clinical examination might be more than enough to establish the diagnosis, and other tests are not indicated. There are several options available for the treatment of tremors. These include both medical as well as surgical treatments. In some instances, decreasing or discontinuing a drug might be enough, while in other cases more complex hormonal treatments might be needed. In any case the selection of the most appropriate treatment depends on the cause of the tremor and should be done by a physician who is an expert in the diagnosis and treatment of these conditions. Several medicines are useful in the amelioration of the tremors, however and with the exception of the mild tremors, they do not result in full suppression of the tremors. Even though these medications have some side effects, the advantages of decreasing the intensity of the tremors, in severe cases, overcomes the disadvantages due to the potential side effects. Alcohol (ethanol) can decrease the intensity of the tremors. Many individuals recognize that drinking alcohol before meals is very helpful. The main side effect is related to the potential risk for addiction to alcohol, and for that reason this is a technique that few practitioners will endorse. Also, when the effects of the ethanol wear off, the tremors return and may even be more intense. One of the most effective medications for essential tremors is propranolol (Inderal, Inderal LA), which is also an alcohol but with no addition effect. There are sustained-release preparations that prolong the effects of the medication for several hours. Side effects of propranolol are bronchospasm (this cannot be used in persons with asthma), sleepiness, and impotence, among others. There are other medications in this family such as metoprolol (Lopressor, Toprol XL) and nadolol (Corgard) that might have fewer side effects but are not as effective. Primidone (Mysoline) a drug first used as an antiepileptic medication, is also useful and is indicated when propranolol is not effective. Other anticonvulsant medications [gabapentin (Neurontin, Gabarone), topiramate (Topamax)] have been tried but they are not considered as first-line treatments. In extreme cases of essential tremor, botulinum toxin might be indicated. However, this treatment is associated with weakness, and its effect is transitory. This treatment may be considered for the most severe cases when propranolol or primidone have failed to relieve symptoms. In some individuals, mostly those with mild tremors, the use of a wristband with weights in it might help to decrease the magnitude of the oscillations. These devices can be useful when eating or drinking. When medications are not effective, one additional option is surgery to destroy the abnormal brain cells that are responsible for the tremors. These cells are located deep in the brain in the thalamus in a bilateral structure called the basal ganglia. There are several nuclei (collections of brain cells) in the thalamus, but the one that is related to tremors is called the ventral intermediate nucleus (VIN). The operation, thalamotomy, can be done by conventional stereotatic surgery or by the use of a Gamma knife (which uses radiation). Since there is one thalamus in each side of the brain, the thalamotomy could be unilateral or bilateral. An additional option is by deep brain stimulation (DBS) with implanted electrodes. Unilateral thalamotomy is indicated when the tremor is predominant or limited to the contralateral limb. It might also be indicated in disabling bilateral limb tremor that is refractory to medication. Bilateral thalamotomy might be indicated in cases of severe bilateral tremor; however, the frequency of the side effects is a limiting factor. Deep brain stimulation is also effective for reducing a contralateral tremor. Both approaches seem to be effective in the suppression of limb tremors. DBS seems to have fewer post-operative complications, but requires more monitoring and adjustments after the operation. The ultimate decision depends upon the individual patient. There is conflicting information regarding the use of surgery or DBS for the treatment of voice or head tremors. 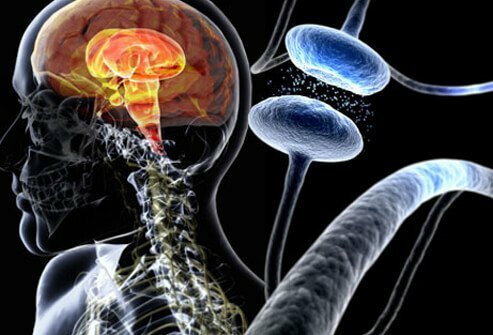 Levodopa/carbidopa (Sinemet) is the most effective medication in terms of improving the motor symptoms associated with Parkinson's disease. However due to the frequent, and sometimes serious side effects of this drug, neurologists prefer trying other medications first. Unfortunately, the medications available [bromocriptine (Parlodel), pergolide (Permax), pramipexole (Mirapex) and ropinirole (Requip)] are not as good as levodopa/carbidopa in the control of the motor symptoms and also have some side effects that limit their use. Selegiline (Eldepryl, Deprenyl) a medication that does not have any major effects on the motor symptoms, might be the only medication with some protective effect of the nerve cells, but this is not yet well proven. The other medications are only used to treat the symptoms. Other medications that can be useful are amantadine (Symmetrel), ethopropazine (Parsidol), trihexyphenidyl (Artane), benztropine (Cogentin), entacapone (Comtan), and tolcapone (Tasmar). In the hands of experienced surgeons operations like thalamotomy and pallidotomy, that excise some areas of the brain related to the persistence of the motor disorder might be indicated. In general, very few selected cases are candidates for surgery, mostly individuals with disabling unilateral movement disorder that is resistant to medication. Deep brain stimulation with electrodes implanted in the brain is a surgical technique that does not require ablation of the brain and might also be useful in selective cases. The indications for surgery are limited, and surgery should be done after carefully considering both the benefits and side effects of the surgery. Transplantation of neurons in the brain to restore the dying cells is an interesting approach; however, this method is still in the experimental phase. In cases in which the tremor is associated with a specific disease, the tremor improves with the treatment of the condition. When anxiety is the only problem or no other cause is found, then propranolol (Inderal, Inderal LA) or clonazepam (Klonopin) could be effective. Just as the selection of the most appropriate treatment depends on the cause of the tremor and should be done by a physician who is an expert in the diagnosis and treatment of these conditions, the same principle applies for the follow-up. Depending upon the cause, follow-up may be very stringent and intense. In conditions in which there is a genetic base, as in the case of the familial form of essential tremor or as could also be the case in Parkinson's disease, there is not much that can be done for the prevention of the condition. In other instances, such as the case of industrial or accidental exposure to toxins, prevention is possible with education and industrial precautions. One of the best examples available is the prevention of lead intoxication in children which used to be common and now, through continuous monitoring of blood levels of lead from early life, is rarely seen.